5 days to less weight, more energy and better digestion. Here’s how to start! This week I’m devoting 5 days to following a grain-free diet. 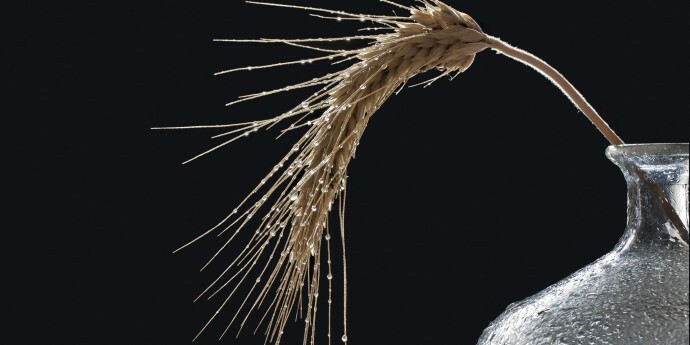 Whole grains, besides being among my favorite foods, are very nourishing. They’re full of vitamins, including B vitamins (which our nerves love) and healthy fats. Besides this they’re a warming food that can ground us when we’re feeling a bit spaced out. And besides all this, they’re delicious. But I need to say goodbye to them for a few days. And my favorite reason for giving up grains is that my appreciation for them grows exponentially. That first bite of porridge I’ll take on Saturday morning is going to taste so good! It’s wise to make a plan before eliminating any food group from your diet rather than just jumping in, eyes closed. Expect to feel hungrier the first day or two since your body will be missing a food it’s used to receiving on a regular basis. So before you get started with a grain-free diet, have some general ideas of what you’re going to eat. No one likes being hungry and at a loss for options to munch on. I hope to help you out there by showing you what I’ll be eating over the next few days. Before you begin a grain-free diet, devote an afternoon to getting a nice supply of snacks in your fridge and pantry. Raw nuts, nut butter, coconut butter, dried fruit, fresh fruit, chia date bars, hummus, cut-up raw veg (for dipping), smoothie ingredients, goat’s or sheep’s milk cheese and yogurt (if you’re on dairy), kale chips…It’s so important to have a variety of snacks on hand before you get hungry. It makes all the difference between reaching into the fridge for homemade hummus and carrot sticks or opening the wrapper of that processed, preservative-laden “all natural” granola bar. Snack as much as you like. One of the many joys about following a whole foods plant-based diet is that your body will tell you when it’s had enough, so no portion-controlling involved. All you have to do is listen to your body. I hope it’s no surprise to you that I’m not a fan of “grain-free products”. I won’t be buying grain-free crackers, cookies or pasta to replace their grain-filled counterparts. The real nutrition exists only in whole foods which, admittedly, take more creativity and work. But I accept this as a challenge. 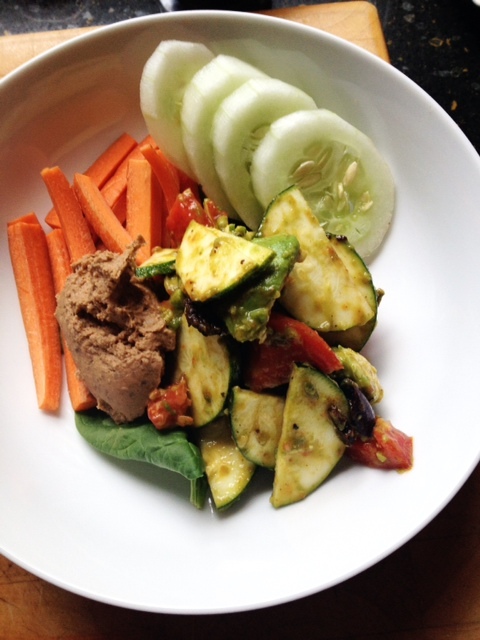 Without grains on my plate, I’m invited to find interesting and tasty ways to get more veggies into my meals. Let leftovers be your friends. If you roast beets for one meal, roast a whole tray of them. Keep them in the fridge to add to salads throughout the week and to make an amazing beet and white bean dip (recipe on the way!). Make your time in the kitchen work towards more than one meal. Process all the ingredients together in a food processor until walnuts are creamy. Store in the fridge. Resist from calling it something fancy like “Omega-3 Spread”…if you can. 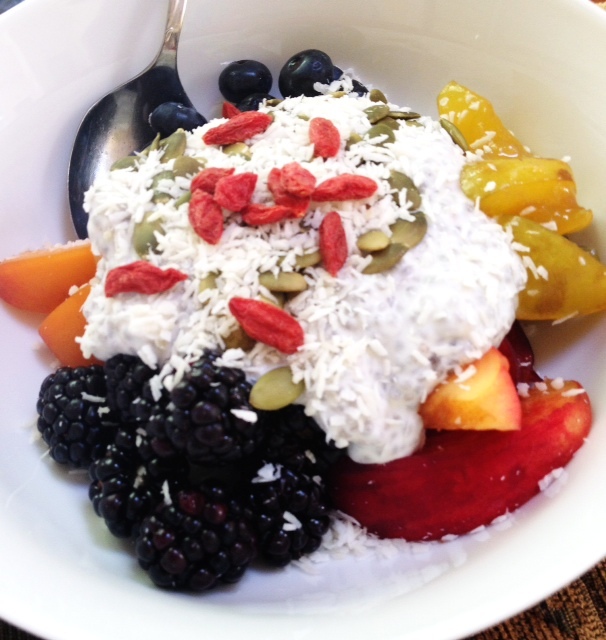 I took a spoonful of this to eat with my pudding, fruit, shredded coconut and goji berries. Breakfast done. Mix all ingredients together in a bowl then serve. This actually doesn’t keep well, so make what you’ll eat in one sitting. It’s nice how the avocado goes delightfully smooshy and coats the zucchini. Mix everything together in a small bowl with a fork. Taste and adjust seasoning. Add more water if too thick. 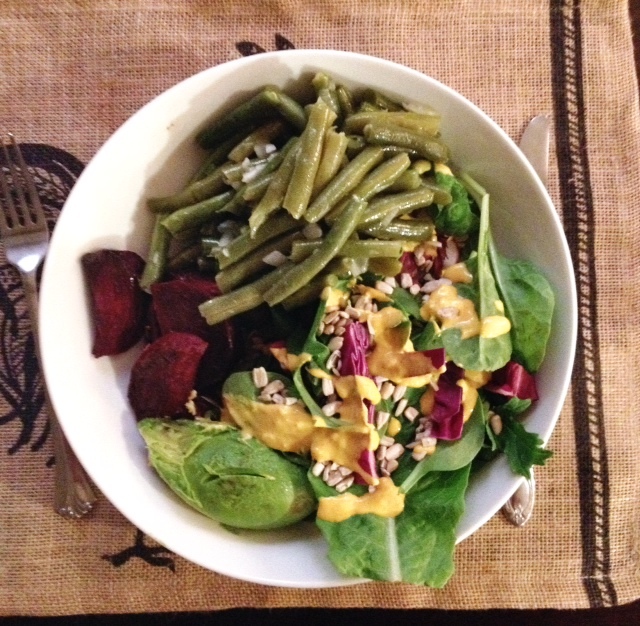 On the side I had “Quick-Pickled” Roasted Beets with my mom’s Braised Green Beans. 1. Preheat oven to 375F. Melt coconut oil on a large baking tray as it heats. 2. Toss the beets with the oil and sprinkle with salt. Roast for about 20 minutes before giving them a stir. Depending on how you cut them, they could take anywhere from 10 to 30 minutes more. They’re cooked once tender (pierce with a knife to know) and pleasingly blackened. 3. Store in a closed container with enough apple cider vinegar to cover. Let them marinate at least 15 minutes before serving. 1. Heat a large saucepan over medium heat. Once hot, add the oil then the onions and garlic. You just want to gently cook them for a minute or two so they begin to soften. 2. Stir in the green beans then pour in the water or stock. Add a generous pinch of salt and pepper. Bring to a boil then reduce heat to a gentle simmer and cover. Stir occasionally and take a test-bite every 10 minutes until they reach the level of tenderness you prefer. Adjust seasoning as needed. Chickpeas or any other legume, grilled or baked chicken, boiled eggs and shredded cheese (if you’re on animal protein) would all be perfect accompaniments to this meal. I hope today and the next few will help you out with undertaking your own temporary break from grains if it’s something you think is right for you. If you choose to follow my menu you’ll be plant-based as well. Just 5 days. You got this!